ATLANTA, March 27, 2019 – BB&T Atlanta Open Tournament Director Eddie Gonzalez announced today that defending champion and five-time champion, John Isner, along with the most decorated doubles team of all-time, Bob and Mike Bryan, and fast rising American Frances Tiafoe will be part of a star-studded summer at the 2019 BB&T Atlanta Open. This year’s event will be held July 20-28, 2019, in a new, more spacious spot at Atlantic Station and will also feature seven-time singles major champion Venus Williams and 2017 US Open finalist Madison Keys in a women’s Sunday Showdown match. Also, on Monday night, July 22, former US Open Champion, ATP World Tour No.1 and BB&T Atlanta Open champ, Andy Roddick will take on rival and metro Atlanta resident Robby Ginepri. 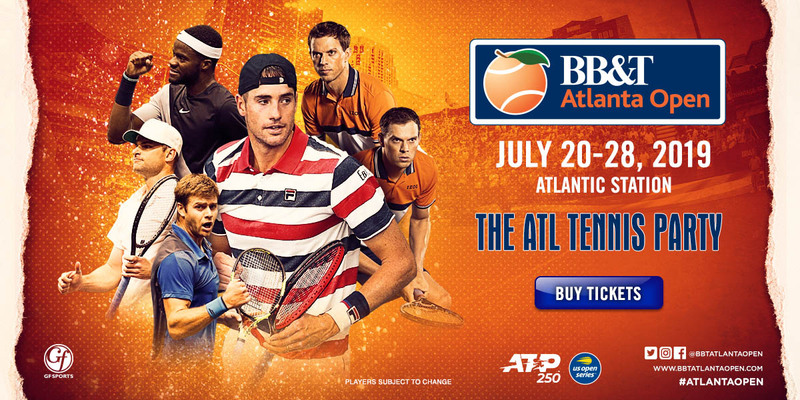 Tickets are on sale now at www.bbtatlantaopen.com. Top-ranked American and world No. 9, Isner, is 31-4 at this event and in 2018, the big serving Georgia Bulldog became the fourth American to win the same tournament at least five times. Pete Sampras, Andre Agassi, John McEnroe and Jimmy Connors have also achieved the feat. He’s going for No. 6 and history in 2019. The 2018 tournament championship was the 14th of Isner's pro career and he’s already looking forward to 2019. The year 2019 marks the Bryan Brothers return to Atlanta as a team. The duo currently owns 117 career ATP World Tour doubles titles and are seeking yet another title to add to their resume. Come out and watch these Americans play their exciting brand of doubles. The twins have been part of a championship Davis Cup squad, earned Olympic gold, and have some 16 majors as a team. Mike owns two additional men’s doubles majors with American Jack Sock. In keeping with BB&T Atlanta Open tradition in being a “Mini US Open,” two of the biggest stars from the WTA Tour - Williams and Keys - will play a Sunday Showdown match the evening of July 21 on Stadium Court. Williams has been ranked No. 1 by the WTA Tour on three separate occasions and has won seven Grand Slam singles titles, 14 Grand Slam doubles titles, and two mixed doubles championships. Serena’s older sister also has four Olympic gold medals and one silver to her credit. This is a special opportunity to see Venus play in the Atlanta market. Keys, 24, is a former WTA Tour No. 7 and 2017 US Open singles finalist. She is known for her powerful serve and dominating forehand. Keys also gives off the court. She is an ambassador for Fearlessly Girl, an organization dedicated to fighting bullying and cyber-bullying, with a focus on reaching out to high school girls. She co-hosted the first summit for the group with founder Kate Whitfield in her hometown of Rock Island, Ill., in 2016. "It will be an honor to play Venus on Stadium Court in Atlanta," adds Keys. “Atlanta has always welcomed me during my tennis career and I'm excited to play this event to kick off the 2019 BB&T Atlanta Open." Williams and Keys have a 2-2 career head-to-head, with Keys winning the last meeting in Montreal in 2016. Monday night’s evening session will begin with Roddick and Ginepri renewing their rivalry. Roddick, an Atlanta favorite since he turned professional and won his first ATP World Tour title in Atlanta in 2001, and then later winning his last singles ATP title at Atlantic Station in 2012. He also claimed the 2003 US Open singles title. Ginepri, who reached a career high ATP ranking of No. 15, now coaches on the ATP World Tour. A native of Marietta, he reached the semifinals of the 2005 US Open. This is a chance to show some love to a great champion and a local tennis legend while they compete once again on a big stage. "I've always appreciated the support I've received in Atlanta,” stated Roddick. “The fans have been with me as I won my first title and I recognized many familiar faces at Atlantic Station when I won my final ATP tour singles title. Atlantans are not just tennis fans, but they play the sport as well, in record numbers. I love knowledgeable tennis fans, and the fact that they know the game so well doesn’t go unnoticed by the players." “It's a thrill for me to have another opportunity to play in front of my hometown fans, and playing Andy under the lights on Stadium Court will be a perfect setting," said Ginepri. Ticket packages for the BB&T Atlanta Open, the only ATP World Tour event in Georgia, go on sale today. The BB&T Atlanta Open has welcomed over 340,000 fans to Atlantic Station over the past nine years, establishing itself as one of the top ATP Tour tennis events in the US. Tickets for the 2019 BB&T Atlanta Open can be purchased at http://www.bbtatlantaopen.com/.